Behavior - Earwigs tend to prefer damp, peaceful environments. They will feed on plants and plant material they find available. Infestations are easy to pick out because if you see multiple earwigs within your home then most likely there is an earwig problem that needs to be addressed. Earwig control is essential to keeping the problem under control as earwigs can become a nuisance if they begin to reproduce in or around your home. Keeping your lawn cut and keeping an eye on basements and garages periodically can keep an earwig infestation from occurring, but if it has already become an issue then giving us a call for earwig removal is the next best step to reclaiming your home. While most earwigs will only be in your home for shelter, some outdoor earwigs may start to eat your grass or anything in your garden. The damage that can be done is minimal, but any damage done by an earwig problem needs to be addressed. 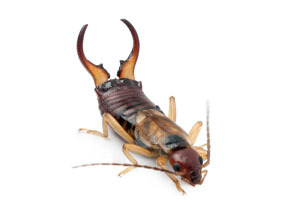 We will come to provide earwig control so that outdoor earwigs do not make it inside your residence and the earwigs that have made it inside will find a new spot to live in.